Food is so much more than the nutrients that make it up. When The TRIM group all came down with Gastro disorders after I had brought to the attention of their subconscious mind that their food was not just nutrients but also all of the consciousness that went into the growing, manufacture, and processing of the food, I knew without any doubt at all that the biggest issue in health, relating to food is not the nutrients at all. The big problem is how we relate to this consciousness. Take for example this picture. 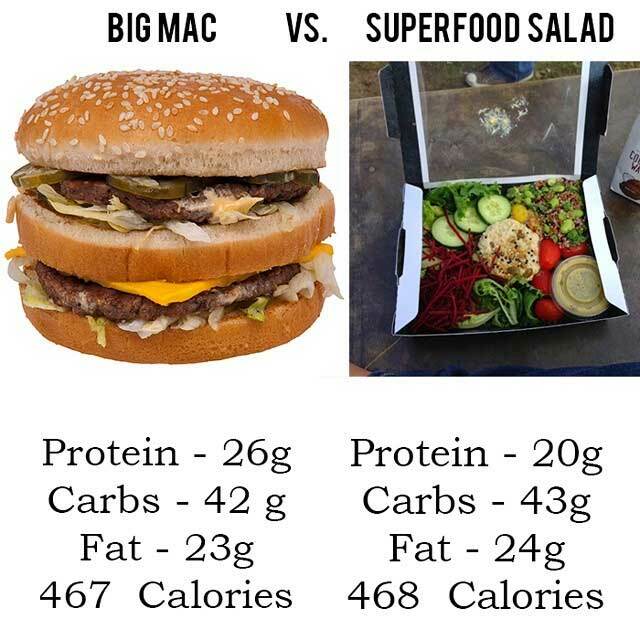 We can assume that the salad on the right is made from organically grown vegetables, whereas we know that there is nothing remotely organic about the Big Mac. So there is going to be a massive difference in the consciousness issues. However what I have found in clinic is that the food on the right can still be full of anger at the way that Humans are exploiting other forms of consciousness, and ​that includes the plants that gave up their lives so that we humans could so conveniently consume that salad. The answer to the obvious question of "so can we in conscience eat anything then?" needs to be considered. However the more immediate question of "can we get more adapted to the anger and cruelty built right into our food ​from the ground up" is an absolute yes. We respect your privacy. To change or delete your subscription takes just one click at any time.